We are engaged in offering a wide range of Sisal Rug. Our offered rug is woven by our dexterous professionals using top grade sisal yarns and latest techniques. 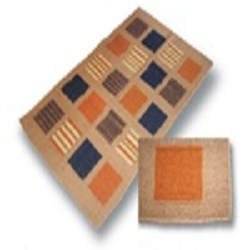 We provide this rug in several attractive designs, patterns and eye-catching colors as per our client’s requirements. Product Material - 30% Wool And 70% Jute. Width Of Rug - 3 Foot (36 Inches). Length Of Rug - 5 Foot (60 Inches). 100% natural sisal, Eco-friendly product. Special rugs for ancient/oriental forniture. Any colour choice. Matching border. Size up to 4 meters width. Wall to wall carpets. Internal application. Color: Black, Grey, Brown, Red, Green, White or As per customer demand. We are offering high quality Sisal Rugs to our most reliable customers which are situated all round the nation. These require very low maintenance. These are widely available in various designer patterns. Sisal fiber is obtained from the leaf of Agave plant which grows in Brazil and East Africa. Sisal is the strongest of all natural fibers and comes in brilliant dyed colours. NCJ sources the finest quality fibers which are dyed, spun and woven into premium products in NCJ factories. - 1-Set - 6 Glass of 5"
- 1 Plate - 12"
We are reputed dealers and manufacturers of marble handicrafts which are specially designed to meet the client's varied requirements. Available in two styles - Roman and Roll-up with maximum width 1.80 mtr.